Aves LOST her first tooth!! Oh man - seeing this makes me remember how much I hated the feeling of losing teeth!! But HOORAY for Avery!!!! Such a big girl! Whoo hoo!! Such an exciting day! My mom still has our tooth fairy pillow from when we were growing up. So fun! I am sure you make a fun and fabulous tooth fairy. 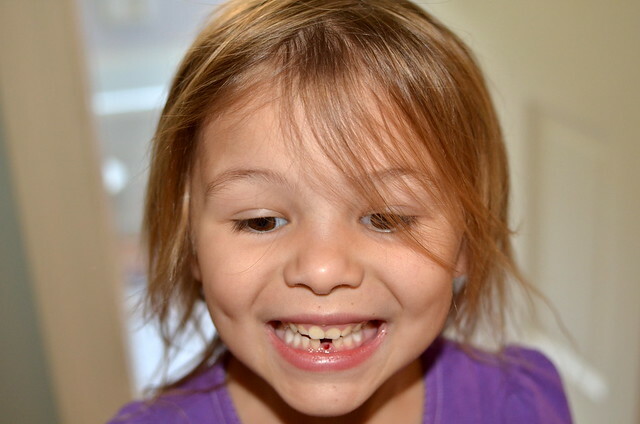 You'll have to update us on Avery's loot so we can plan accordingly when the time comes for our kiddos to lose their teeth. She's a doll. Looks JUST like her pretty mama. AHH! Where has the time gone? Teeth, she's losing teeth!? My little guy (almost 3) had an injured tooth extracted today. Oh, and if you are ever interested in a good resource on caring for little teeth I've recently found this Mom's Guide to be helpful (http://www.1dental.com/moms-guide/) I've been trying to get a shot that's even half this cute! 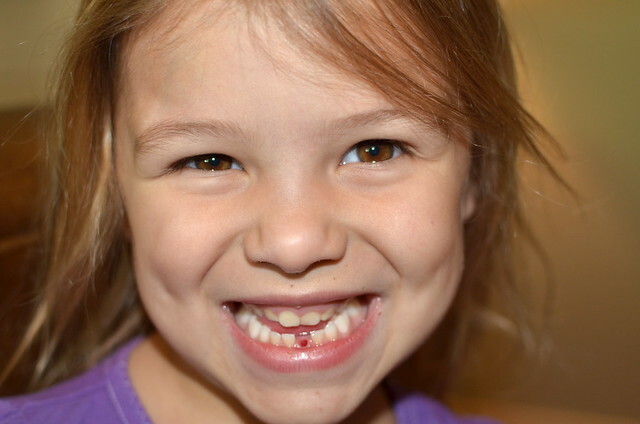 Reminds me so much of when I was a kid... that squishy gap between the teeth! :) Such a fun new stage for these kids! It's someones special day today!